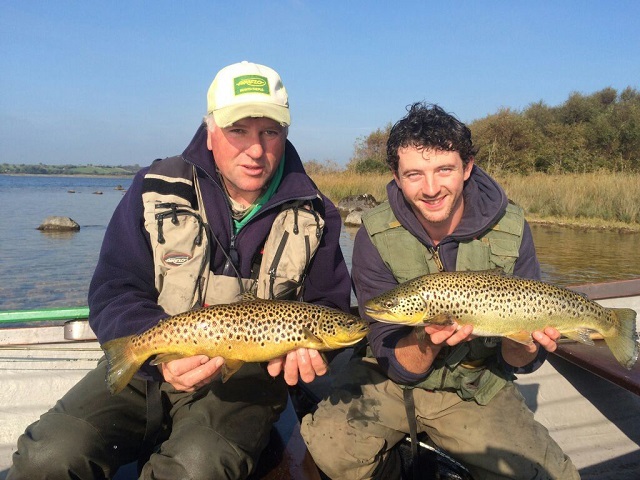 Declan Gibbons reports that Larry McCarthy of Corrib View Lodge reported a wonderful finish to an amazing season. Bill Brown fished over two days with Larry and had great sport with dry fly catching fish to 4lb. Steve Whitewater from the UK fished on one day and boated 4 trout to 2lbs. Local lad Dara Lynch fished on the last day of the season with Larry and they boated 5 trout between 2lbs and 4.5lbs.Dara had the best fish on a size 16 dry olive pattern in Ballynalty Bay. The perfect end to a fantastic season on Corrib for Larry McCarthy and Dara Lynch. Donal Connolly from Nonaim Lodge was also in touch with a report on the last week of the season in the Glann area. Dennis Cleary had 2 trout on wetfly, best was 3.25lbs and also a 1.5lbs trout. Pat Vincent had a lovely 2.5lbs trout on wetfly in very sunny, calm conditions. Rob Cooksley had 7 trout on wet and dry fly over two days averaging 1.5lbs, with the best fish just under 3lbs, caught on a dry sedge pattern. Donal was out fishing with Jack Zager, and they had a very enjoyable day's wet fly fishing with 6 landed - best was almost 2.75lbs and the smallest was 1.5lb with several more in the 2.5lb bracket. Lovely sport with the end of the season in sight, and good memories to keep the spirits up during the close season. Donal was also out for an afternoon on his own and had 3 trout for 7.5lbs - all were like peas in a pod in the 2.5lbs bracket. All fish were released. Dennis Cleary with a fine 3.25lbs Corrib trout taken in the last week of the season while fishing with angling guide Donal Connolly. Bill Quaile was in touch with a report of excellent late season fishing on Carra. Himself and friend Owen McFadden had 2 great days on the lake in late September, boating 13 fish from 1lb to 3.65lbs, and only 2 fish were below 1.5lbs. Bill mentioned that they had an excellent season all over, with great early season fishing on Mask, brilliant fishing on Sheelin during the summer on sedges, and Carra coming good late in the season. The only regret Bill had was missing out on the late mayfly hatch on Corrib in August, which produced great fishing as well. Bill Quaile with a nice late season trout from Carra, where he and Owen McFadden had fantastic sport. With the end of the game season, while many anglers are packing away the rods, some are turning their thoughts to other pursuits, including sea angling. This time of year is excellent for sea angling, with water temperatures still relatively warm, and bait fish aplenty for the bigger fish to feed on. The Helm in Westport hosted their annual Skate Festival over last weekend, and once again it was a roaring success for Vinny and his crew in the Helm. 100 anglers competed over the two days, all vying to catch the biggest skate in the bay, with a massive €2,000 prize on offer for the best fish. The fishing this year was excellent, and a new record was set with 8 skate landed over the weekend, plus 2 lost, as well as large numbers of dogfish, in addition to thornback ray and bull huss. The highlight of the festival is the prizegiving ceremony on Sunday night, when the envelopes are opened and the fish are measured. When a skate is landed, the boat skipper stretches a string across from wingtip to wingtip and cuts it to the exact length of the wingspan. The string is then put into an envelope with the angler's name and sealed, so no one knows until all the strings are measured who has caught the largest fish. When the envelopes were opened late on Sunday night, the longest string belonged to Josie Faherty from Clifden, with a monster skate of 71 inches wingspan. That equates to approx. 200lbs weight. The winning fish at the 2015 Westport Skate Festival, caught by Josie Faherty from Clifden. The fish measured 71 inches across the wingspan, estimated at 200lbs weight. All the skate caught were tagged and released again. Photo courtesy John O'Connor. John Fleming, skipper of the Brazen Hussy II in Galway, has been producing fine fishing lately for clients. Last week they had their best blue shark yet, a fine fish estimated at 109lbs caught by David O'Malley which measured over 2 metres long. This is a specimen fish which will be entered for a specimen fish award. Well done to David and John! 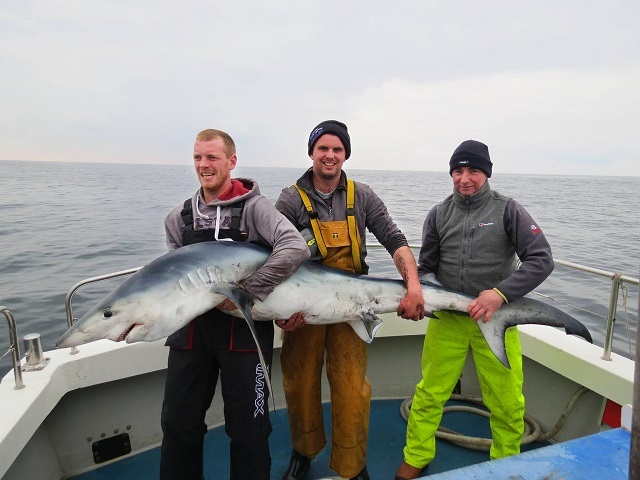 A fine specimen blue shark estimated at 109lbs caught by David O'Malley (left) aboard the Brazen Hussy II in Galway Bay recently. John's anglers have also been enjoying good mixed species fishing lately, including some nie spurdogs caught in late September. 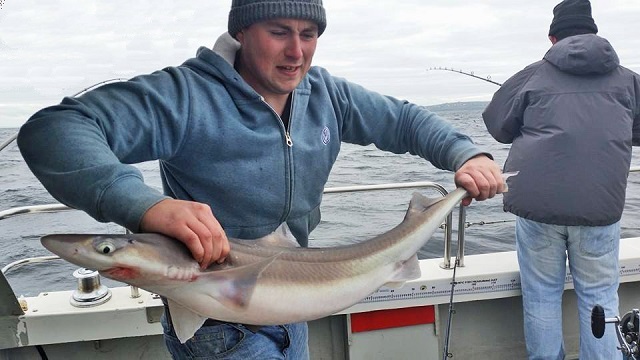 A nice spurdog caught aboard the Brazen Hussy II in Galway Bay.